I have a deep respect and love of tradition. It began as a child growing up in the old Poor Farm in Carlisle, Massachusetts with my family; watching my father lovingly –and painstakingly—restore it to a new life. Admiration for the innovation, hard work and craftsmanship of earlier times grew into a commitment to continue the tradition and craftsmanship of woodworking. After receiving a B.A. 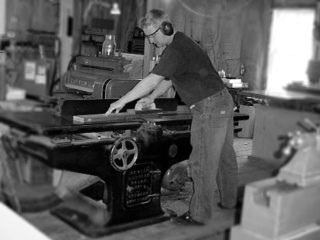 from Whitman College in Sociology and Environmental Studies, I was honored to train and graduate from the prestigious Cabinet and Furniture Making program at the North Bennet Street School in Boston, Massachusetts. My experience at North Bennet Street School created a reverence for handcrafted furniture, whose quality and beauty is unmatched by commercial furniture. It further developed in me a desire to build something that is beautiful and functional; and, most importantly, furniture that will become family heirlooms that will last for generations. My workshop is in a post and beam barn built by hand with help from dear friends and family in Groton, Massachusetts. I have also been toiling away at an old house—as my father did—in an early 19th century home with my ever-supportive wife and sons. It’s a labor of love, but so worth the time, resources and energy to save a valuable piece of American history. Peter’s Philosophy. Each piece I build uses time-tested methods of traditional joinery and construction to ensure a functional piece that will last for generations. I draw my inspiration from the many genres of traditional 18th century American furniture making, such as Colonial, Shaker, Federal, Queen Anne and Chippendale. I believe you should be a partner in the design of your piece so that you can feel a sense of ownership and pride in the final product. I am committed to using locally sourced and FSC-certified wood whenever possible and enjoy hand picking the right piece of wood to uniquely fit the design and beauty of each piece. Copyright © 2019. 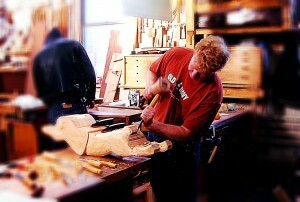 Peter Benedict Furniture Maker / All Rights Reserved.